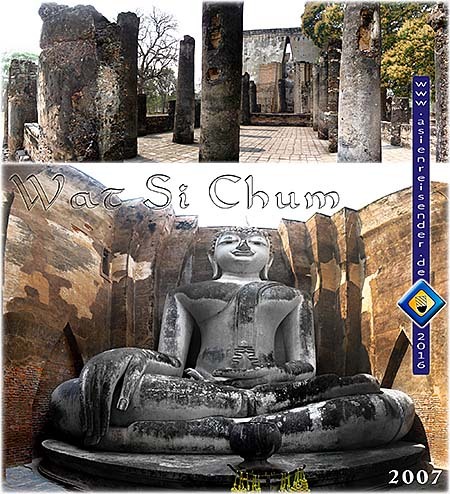 For the 'Map of Sukhothai Historical Park' click the link or the image. 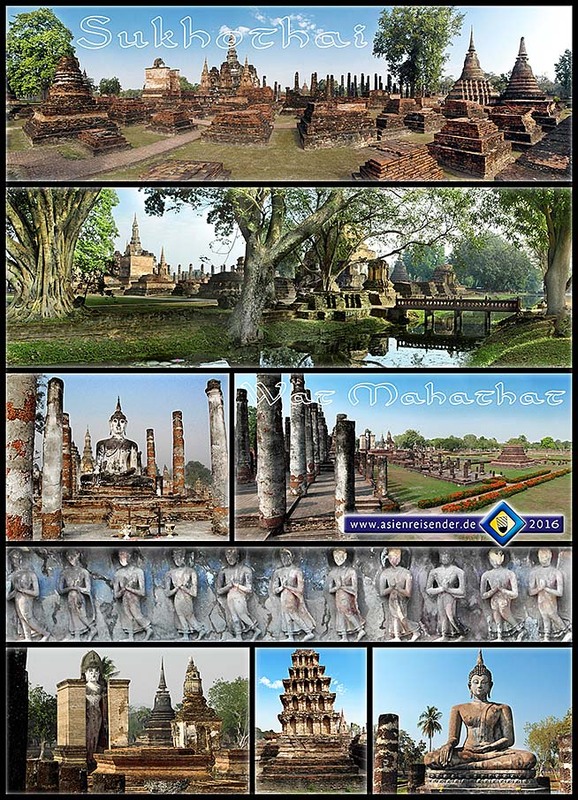 For the 'Map of the Kingdom of Sukhothai' click the image or the link. 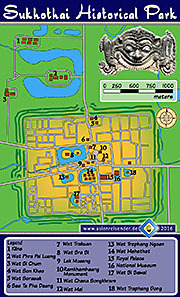 For a 'Map of the Kingdom of Ayutthaya' click the link or the image. Sukhothai is an ancient city situated in the north of Thailand's central plains. 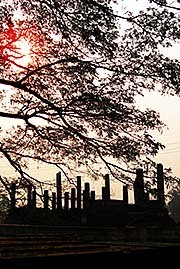 The historical Sukhothai is now a necropolis, in distinction to New Sukhothai, some 14 kilometers east. Medieval Sukhothai was the capital of one of the early Siamese/Thai kingdoms, the kingdom of Sukhothai. The large old city is now a historical park and declared World Cultural Heritage by the UNESCO. 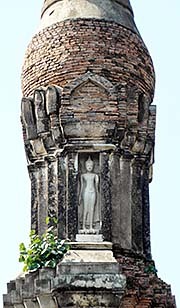 In the common and official Thai view of history, the empire of Sukhothai was the first Thai kingdom, followed then by the kingdom of Ayutthaya. However, in the Sukhothai era (1238-1378) there were several other Thai kingdoms existing around, like the northern kingdoms of Lanna and Phayao. 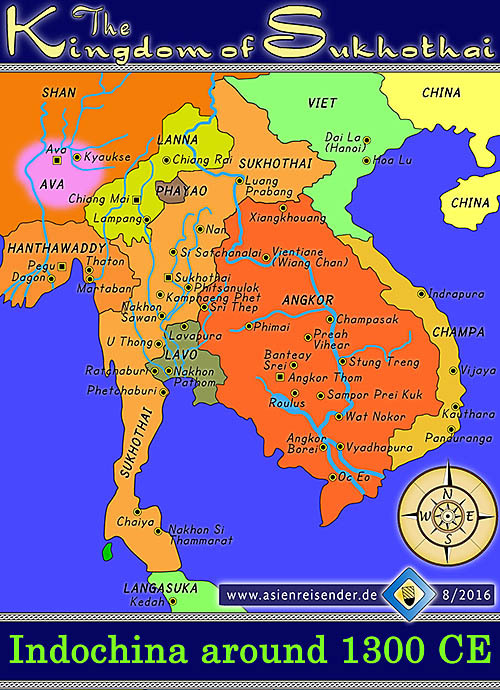 Also before Sukhothai there were Thai Kingdoms existing in the north, as for example Ngoenyang, with it's center in Chiang Saen. However, Sukhothai is a Thai national myth. 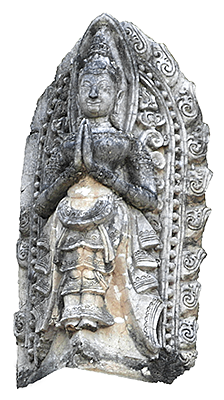 It is the most important center of early Thai culture, and in Sukhothai were some standards set for the further development of Thai culture, as for example the adaption to Theravada Buddhism and the development of the Thai script. 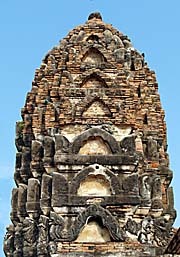 As a fusion of older, local cultures and the influences of Mon and Khmer cultures, the immigrating Tai people who settled here created the unique Sukhothai architectonical style. And there is much more known about Sukhothai than about the other Thai kingdoms of the time, what makes it look more important. 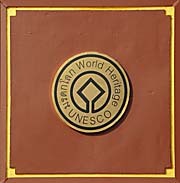 Nowadays Sukhothai Historical Park is a UNESCO World Heritage site since 1991. Included into the heritage are the two other sites Si Satchanalai and Kamphaeng Phet. The same script, art, architecture and law codes make it clear how much the three places were related to each other. Sukhothai means, by the way, in translation somewhat like 'dawn of happiness'. In my opinion, Sukhothai Historical Park is one of the nicest cultural/historical sights in Southeast Asia. It can cope with the necropolis of Angkor Wat / Angkor Thom in quality and gives much more benign impressions than the leftover of the sinister Khmer empire. Nowadays Sukhothai is a large historical park with a great number of architectonical remains and with a very large wider surrounding where more ruins are to visit. As it is everywhere the case in Southeast Asia, most of the remains are temple buildings. Temples were, except fortifications and city walls, the only buildings built in stone. The prefered material here were red bricks, in lesser quantity also laterite. Sukhothai Historical Park is a big area, although less big than Ayutthaya Historical Park. Parts of it are open, but most parts are fenced and entrance is charged. Foreigners pay, as always for Thailand's sights, five times the price as nationals do. 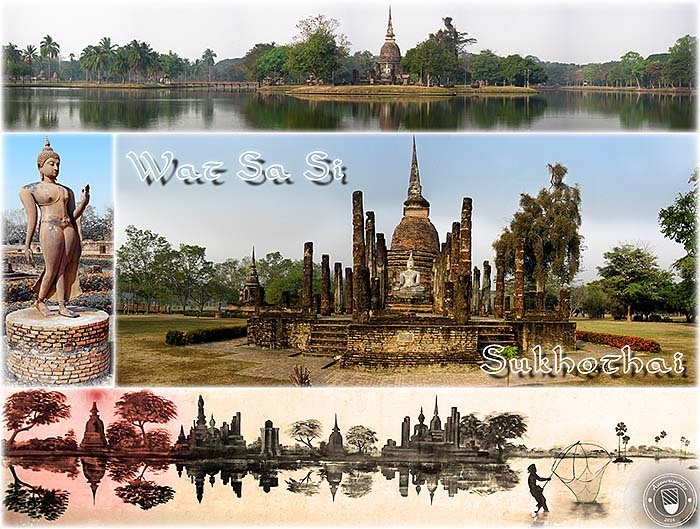 The work to create Sukhothai Historical Park begun in 1976, and it was opened officially in 1988, three years before it became the heritage label of the UNESCO. The Ramkhamhaeng Museum at the park's entrance was first opened in 1964. However, it looks very modern and has doubtlessly upgraded since. Alltogether are almost 200 temple ruins inside the wider park, an area which covers alltogether 70km2. The oldest of them date back at least to the early 13th century, but maybe their first inauguration lies centuries further back. The core of the historical park is the old city itself, which was walled and surrounded by a wide water trench. 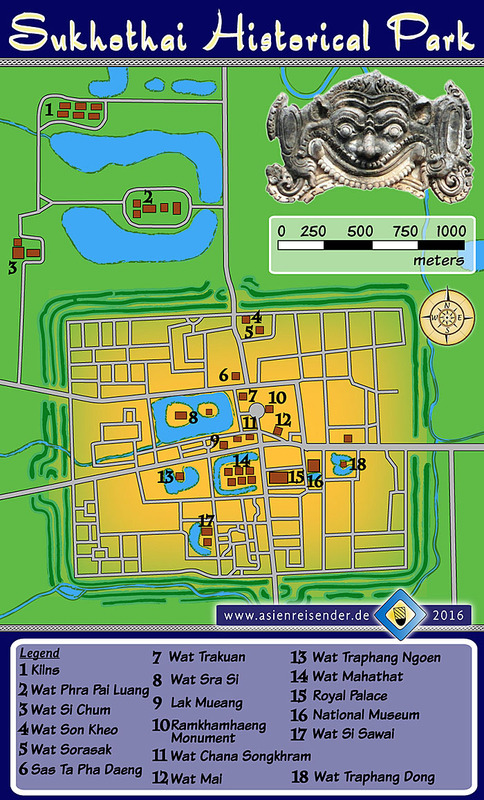 It had only four city gates, who where in the center of the sides between the four corners. The old city was two kilometers in east-west length and 1,6km in north-south length. The walled area is therefore spacious and at least twentysix large temple buildings are to visit here. Not too much of the old city walls remains, but parts are still there. The remains of the city's trenches lie outside the walls. Beyond the ancient town are in all four directions of the compass more ruins to visit. Wat Mahathat of Sukhothai, the main temple respectively the 'temple with the grand relic', was the central and most important temple in the empire, closely placed into the direct neighbourhood of the royal palace. The foundation of Wat Mahathat dates probably back to Sukhothai's first independent king Sri Indraditya and the time between 1238 and the years after, not later than 1270. The original building was probably only the central platform with five chedis. The temple complex was then continuously extended on an area of 200m x 200m with 200 chedis and a number of smaller buildings. What we see nowadays are the remains of what the compound was in the time of king Loe Thai around 1345. The chedi with the holy relic is placed on a square-shaped terrace, in who's walls is a relief of a row of Buddha's disciples. There are alltogether 40 of them with a height of one meter. Many other ornamentic details are adorning the buildings. A number of the main temple's Buddha statues, it;s said, are still the originals. 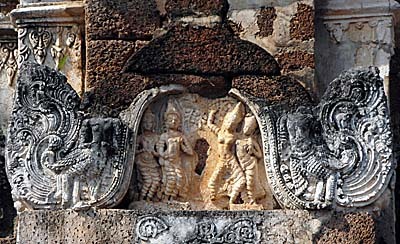 Some of the many buildings show Angkorean influence, others influence of the Mon Haripunchai empire of the northern Dvaravati Culture and again others show Lanna style elements. The biggest and central part of the site is the former city center with Wat Mahathat, Wat Si Sawai, a memorial of king Ramkhamhaeng and a number of other temples. Although it's a wide area, it is still possible to see everything on foot within a day, when being a good walker. A bicycle helps to come around easier. Bikes can be rent next to the park's entrance. Some other sights are a bit apart from the center, as Wat Phra Phai Luang or Wat Si Chom. West of the old city the plain borders to some smaller mountains. Here are a couple of more temple ruins (out of the city wall). One of them, built up in a slope, is Wat Saphan Hin. The place offers a view over the area to the east, but Old Sukhothai is not to see from there. This trip is more recommendable for enjoying the nice surroundings of a quiet Thai rural area with little traffic, provided one drives on the southern small roads and not on the mainroad. Surrounded by a system of canals, Sukhtothai was another hydraulic city. Much of the old infrastructure is still in use. The historical park is actually much larger than the inner core here on the map. When being in the Historical Park it's remarkable how quiet and peaceful it at once is, after leaving New Sukhothai and all the traffic of the main roads. No rush of cars and motorbikes, a green oasis. However, that does not mean that there is no traffic in the park. People are allowed to enter the historical park with cars and motorbikes, they are just charged extra for the vehicles. It's additional business. From midday on there are too many cars in the park to feel still well, except on the sidepaths of the place. For the Orientals here that does not mean an annoyance. Car's never mean that. The real annoyance for them would be to walk a few meters. That's something what already George Orwell mentioned in the 1930s: Orientals have a deep aversion against walking. Although it wouldn't harm them to change this attitude. Besides of all the disadvantages of motorized traffic the rate of overwheight people in Thailand is skyrocketing. Orientals who come to wealth go immediately decadent. In the centuries before the secession of Sukhothai from the empire of Angkor (in 1238), tribal Tai people came successively from the south of China over the northern mountains into the plains of nowadays Thailand. The first settlements they founded came apparently under the rule of Angkor. Sukhothai was a trade post of Lavo, a Mon city which was an important province of Angkor. Some historians follow the idea that Sukhothai broke the ties to Lavo already for a first time in 1180, but was then reconquered by Mon People from Lavo. A second independence was reached in the year 1238 CE, which was successfull in the long run. 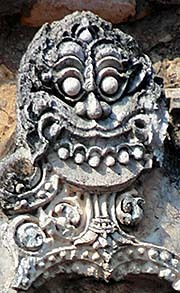 The leading Tai character was Bangklanghao, who became after the new kingdom's independence king Sri Indraditya. Tribute to Angkor wasn't delivered anymore and the Khmer were at first anyhow unable to gain control back over the place. The Khmer empire was already in decline, and the monument building obsession in the Cambodian plains between the Kulen Mountains and the great lake Tonle Sap cost them so much workforce that they didn't prove capable to maintain their rule over the former northern vassal. At the end of Sri Indraditya's reign in 1257, the Tai's controlled the whole upper Chao Phraya plains including Si Satchanalai and Kamphaeng Phet. However, Angkor started repeatedly attacks on Sukhothai. Around 1260 there was a decisive battle near the city, which was won by the Thai. The following centuries witnessed the long-term military conflict between the emerging Tai and the Khmer, which led eventually to the downfall of Angkor Thom (1431) and the breakdown of the formerly so powerful Khmer empire. 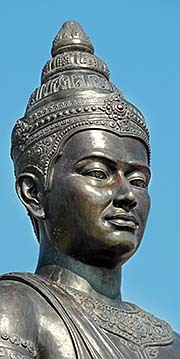 In 1279 king Ramkhamhaeng (1239 - 1298) became the successor of his brother, king Ban Mueang. 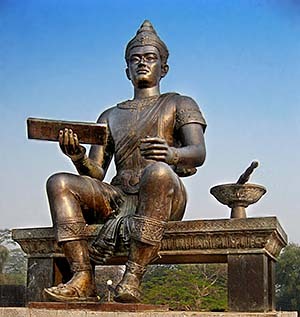 Ramkhamhaeng is described as a first key personality in Thai historiography. His politics were very expansive. Together with other Tai (yet without 'h') tribes of the north he expanded the empire of Sukhothai to the north, including Phrae, Nan, nowadays Luang Prabang and even paritally over Vientiane. In the west, the kingdom expanded allegedly to Pegu and in the south deeply into the Malay Peninsula, including Ligor. The expansion was not only militarily, but also accompanied by diplomatic efforts and favoured by cultural means. The Tai People got an increasingly growing stream of new immigrants from south China, due to the pressure coming from the military campaigns of Kublai Khan's Mongol armees further north. The growing manpower supported the Tai states of Lanna and Sukhothai, who resisted against the much bigger powers of the Mongols (particularly king Mangrai of Lanna) and the sinister Khmer. It's said that the wars against the Khmer slave empire were particularly brutal. Over the centuries until the 20th century, there was a never interrupted migration from China into the Thai territories. The deeper significance of king Ramkhamhaeng lies not so much in his military successes, but in his cultural acquisitions. 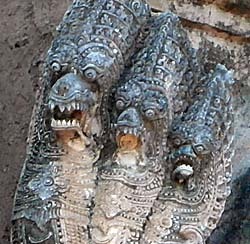 In the Khmer times, Sukhothai was still dominated by Hindu religion, Angkor's state religion at the time. 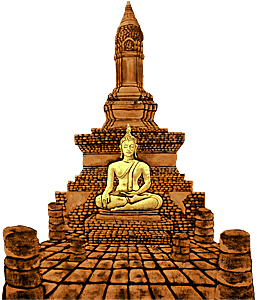 Ramkhamhaeng invited Theravada Buddhism into his kingdom, what made a clear cultural difference. Ramkhamhaeng invited monks from Sri Lanka to manifest the new religion through teachings. The new religion set cultural standards who are still alive in contemporary Thailand. Also an early education system, certainly based on religious teachings, is mentioned. 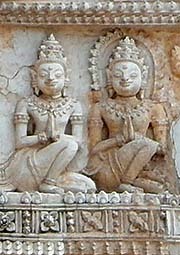 Moreover is the king officially seen as the inventor of the Thai script, what is a derivation of the old Mon and Khmer scripts, who are of Indian roots and base on Sanskrit, Pali and Grantha. 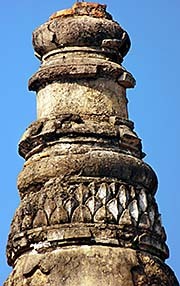 However, this point, which is based on the hundreds of Silajaruek stelas found in Sukhothai, is under dispute. It could make actually a good example of 'invented tradition' (Eric Hobsbawm). 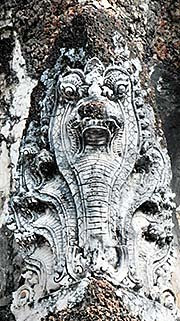 The Thai script was, according to the official narrative, developed on hundreds of these mentioned stone stelas. Most remarkable is the first stela (known as 'inscription no. 1'), called 'Silajaruek Pokhun Ramkhamhaeng'. This stela was allegedly discovered by prince Mongkut (later king Rama IV) in 1833, a time in which he lived as a monk in Sukhothai. On this stela there is an idyllic depiction of the kingdom of Sukhothai given, including a wise king and a kind of father-children relationship between the king and his people. It's written there that the king had a bell outside his palace; every citizen could ring the bell to talk to the king in case there was a complaint or any other matter of importance. 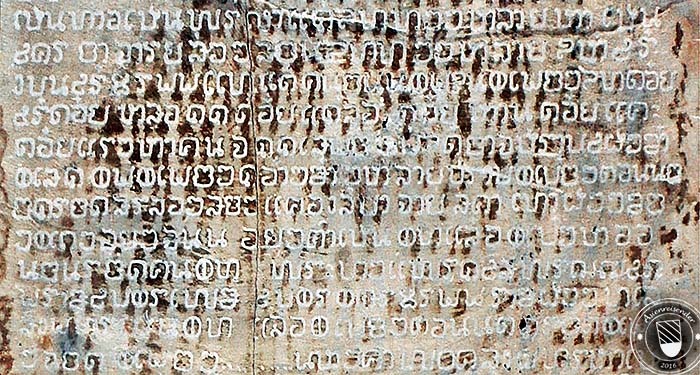 The famous Ramkhamhaeng stela with the inscription no. 1 in Sukhothai Historical Park. The original is placed in the National Museum of Bangkok. The stela here is a replica. Much what we know of the heyday of Sukhothai, and particularly of king Ramkhamhaeng, the most significant king of Sukhothai, derives from the inscription of stele no. 1. Formally, the item is registered by the UNESCO as the King Ramkhamhaeng Inscription. The origin of the stela dates back allegedly to the year 1292. It's further claimed that the piece was found in 1833 by prince Mongkut, who spent a time in Sukhothai as a monk. Mongkut was an intelligent man with a strong interest in sciences and history. As the king of Siam in the time from 1851 to 1868, he was the first great modernizer of the country. However, the authenticity of the stele is under dispute. Most Thai scholars advocate the historical genuineness of the inscription. Those who don't, come easily under pressure. It's dangerous to question dogmas. Western historians, who see things with distance and another view, tend to question sources and contents. The British historian Michael Wright, who worked with the Siam Society, was even cursed by magic means by some people of contemporary Sukhothai, who couldn't stand such heresy. He, who lives permanently in Thailand, was also threatened by Thailand's notorious lese majeste laws. Does intimidation help to find the historical truth? Even if the stele is of medieval origin, it still doesn't mean that the content is true. It's rather probable in this case, that it is a piece of propaganda of the time. The nice, family-like relationship between king and people sounds pretty unbeliveable. All what we know about the ancient Asian civilizations is that they all stood in the pattern of Oriental despotism (see also: The Role of City States in Southeast Asia). Sukhothai was certainly not an exception. In the time of king Mongkut, the early and mid 19th century, the European colonial power grew massively in Southeast Asia. Mongkut witnessed the British - Burmese wars and saw the great western rival of Siam declining to a colonialized region of the British empire, as Malaya was already. The Dutch had already a strong hand on nowadays Indonesia and they permanently expanded their position. Soon later, the French developed a great appetite for Vietnam, then expanding over Cambodia and Laos westwards towards Siam. Bangkok Siam was under pressure to prove the western powers that it was a modern, developed and civilized country in the western way. A consistent national narrative, containing somewhat of a democratic tradition, was very helpful to delegitimize the western powers to overtake just another savage country, as they saw it. What we call nowadays democracy and what is the concept of nationalism roots in the French Revolution and was spread out over the then developed world by the Napoleonic Wars. The legitimation pattern for western imperialism was, after Christianity in the first step, western civilization and later democracy. The text of inscription no. 1 is very adaptable to these modern concepts. It helped creating a national self-concept for a modern Thai nation and to keep colonial ambitions on distance. The academic Priya Krairiksh noted similarities between the use of vowels in the stele who show influences of the European alphabet. Other scholars argue that parts of the inscriptions are original, others, and most of them, are added later. 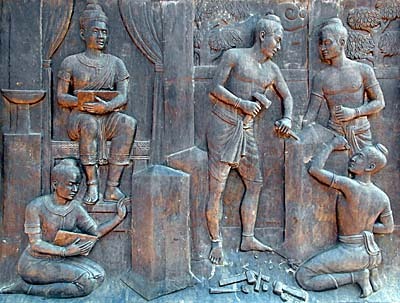 Some claim, the stela was created by a later king of Sukhothai. The 19th century ethnologist Adolf Bastian wrote an elaborate essay with the title 'On Some Siamese Inscriptions'. He notes also the way the vowels are used, but doesn't mention the possibility the stele could be counterfeit. However, one shouldn't forget the words that the ruling art is always the art of the ruling class. The story is just too nice to be true. Of course, it's nice to belive in good things, but the decisive question is always the question for the truth. The first establishment of diplomatic relations to China (the Yuan Dynasty) falls also in the time of Ramkhamhaeng. The really large territory of Sukhothai in the late 13th century was certainly not under firm control of the kingdom. It was rather comparable with the kingdom of Ayutthaya, where the conquered cities, who belonged to the empire, were merely vassals but had several rights of self-government and decision-making. In the case of a crisis in the center of the empire the vasalls were usually tending to take advantage of that weakness, above all with the intention of gaining independence. 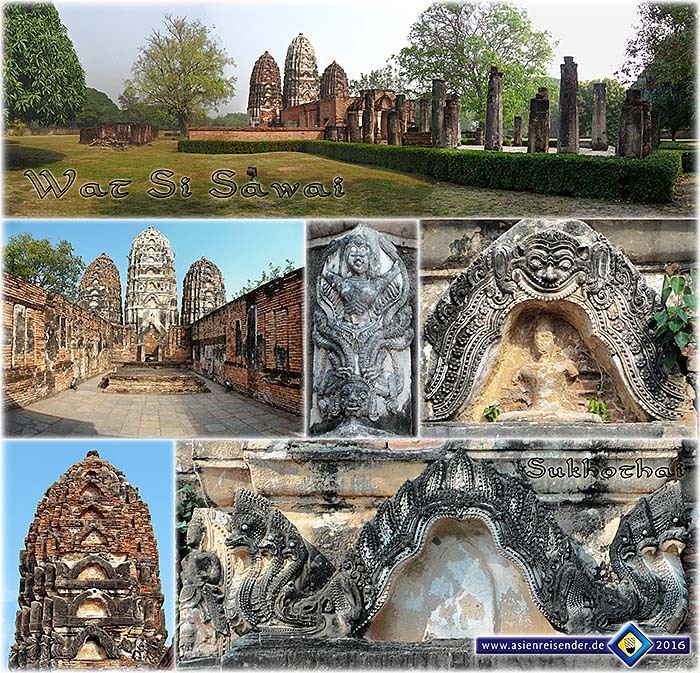 Founded probably in the late 12th century, Wat Si Sawai served as an Angkorean Shiva temple. It's one of the oldest temples in the historical park. The walls of the viharn are still there, the roof not. It is a later addition which has been made by Thai Buddhists in the time when the Khmer were no more in rule here. There are many fresquos in the three prangs, but all of them are damaged. Any prang has a cell in it's base in which probably idols of the three highest Hindu gods were placed. The city of Sukhothai flourished in the reign of king Ramkhamhaeng, it grew bigger, got improved city walls and a canal system. Indochina around 1350 CE. The decline of the empire of Angkor is in it's first stage. The Sukhothai era was short, it lasted not much longer than a hundred years. After king Ramkhamhaeng's death the empire of Sukhothai declined already. The vassals broke away step by step, and Sukhothai was more and more reduced to it's core territory, Sukhothai City, Si Satchanalai and Kamphaeng Phet. 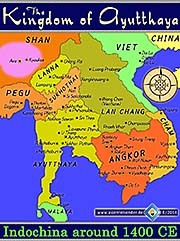 The northern empire of Lanna even captured Tak (and the mountainous trade post of nowadays Mae Sot) in 1321. Sukhothai was reduced to it's core territories again. The fast rise of the new kingdom of Ayutthaya from 1351 on made Ayutthaya the new dominating power in the region. In 1378 an army from Ayutthaya invaded Sukhothai and made it one of it's vassals. After a short reesteblishment of independence in 1400, it came again under Ayutthayan rule in 1412. 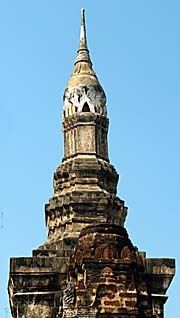 In the 15th century the relationship between Sukhothai and Ayutthaya became a dynastic union due to marriages (1438). Wat Sa Si (sometimes Sra Si) is a temple compound in Sukhothai Historical Park, situated on an island, surrounded by the not too small lake Traphang Trakuan. It's one of the most beautiful sites in the park. In November happens here the annual Loi Krathong Festival. The architectonical style is different from most what we see in Southeast Asia; it's of Ceylonese origin, as well as the two neighbouring temples Wat Trakuan and Wat Chana Songkhram. All three temples had in the past a greater number of additional chedis, of who most are gone; left are mostly only their stumps in the ground. There are many, many Buddha statues in Sukhothai Historical Park, and not only here; it's the same in any place of religious significance in Thailand. Buddha's are plenty, in all sizes and in confusingly many different expressions. There are busy factories in Thailand who produce statues for the mass market, but the really valuable ones were made by skillfull artists, often hundreds of years ago. A Buddha statue is actually not meant as a decoration or primarily as a piece of art; it's rather meant to remind the visitor to Buddha and as a lesson or teaching. The creation of a Buddha is seen as a good deed and is often believed as increasing the kharma, giving the artist a better next life. 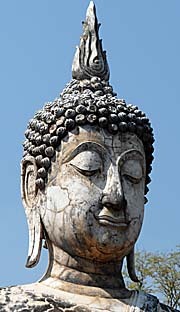 Among all the many different styles, types and eras of Buddha statues, the Sukhothai style is often revered as being among the most artfull and beautiful kinds. 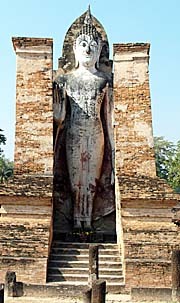 Much of the history of Sukhothai is based on the mentioned stela no. 1. Though, it's authenticity is under dispute. The controversity about that topic is lead quite emotionally. The 'inscription no. 1' is rather a national myth than a serious historical evidence of the 13th century. Serious historians suppose that the inscription no. 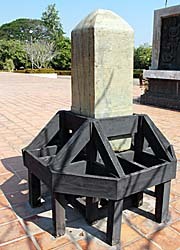 1 has been a fabrication made in the time of prince Mongkut's monkship in Sukhothai. It's content matches perfectly into the ideas of the 19th century, not to the 13th. And obviously the description of the medieval kingdom of Sukhothai sounds like a fairy-tale, not like a serious report of the kind as for example Simon de la Loubere or the merchants of the Dutch East India Company like Jeremias van Vliet gave about the kingdom of Ayutthaya. 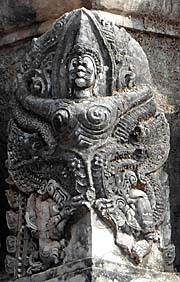 Though, much of the Thai national self-conception is built on this stela. Proofing it wrong means shaking the foundations of the official Thai historical narrative. After all, much of Sukhothai's and Thai historiography in general remains doubtful and dubious. By the way: in the epic computer game/simulation 'Civilization V' one of the playable parties is Thai. It's ruler is king Ramkhamhaeng. Some 14 kilometers east of historical Sukhothai a modern town, New Sukhothai, is placed. It's also the capital of Sukhothai Province. Here are all the facilities for tourists and travellers as hotels, restaurants, food markets and transport. The place fell victim to a desastrous fire in 1968, which destroyed the whole town. All what makes New Sukhothai nowadays, is of a younger age. In fact it's an ordinary Thai town and itself of no interest. In the past the buses stopped at the central market place, where all the facilities are around. A few years ago there was a new bus station built. 'New' in our times means almost always a decline by design. The new bus station is some kilometers outside of the town. And the best about it: there is no public transport from or to the bus station to the town. One has to walk a few kilometers on the highway without sidewalk in the heat - or taking a taxi. The taxi then costs for the last four kilometers two times the price than the bus did for the sixty kilometers from Phitsanulok. Bingo! That's city planning in the age of neoliberalism. Failure by design for the sake of a few driver jobs and maybe a little bit more tax income for the community. The people have to accept all the annoyances; they are anyway suggested better to buy a car. A new, big car. But, as I found out a few days later, there is a way to walk to the town, using a shortcut through the rice paddies. The beginning is a dirt road, it starts left of the few restaurants opposite the main entrance of the station. Using the shortcut, New Sukhothai is in walking distance. The walk is easy and there are even two guesthouses on the way. More (the most) guesthouses are behind the main road with the main bridge. Besides, traffic must have doubled in the last few years. It's incredible how much tin is flooding on the street. Noise, dust, smog and danger terrorize the place more than ever before. It seems that any government boosts much (credit-bubble) money into the economy to make the people buying cars.